Start this ball exercise by lying on your back, arms straight out to the side. Rest your legs on the ball such that your hips and knees are at roughly 90 degrees and the back of your thighs are against the exercise ball. Slowly lower one leg flat to the floor and return it to the exercise ball. Try Leg Drops with Arms Crossed. 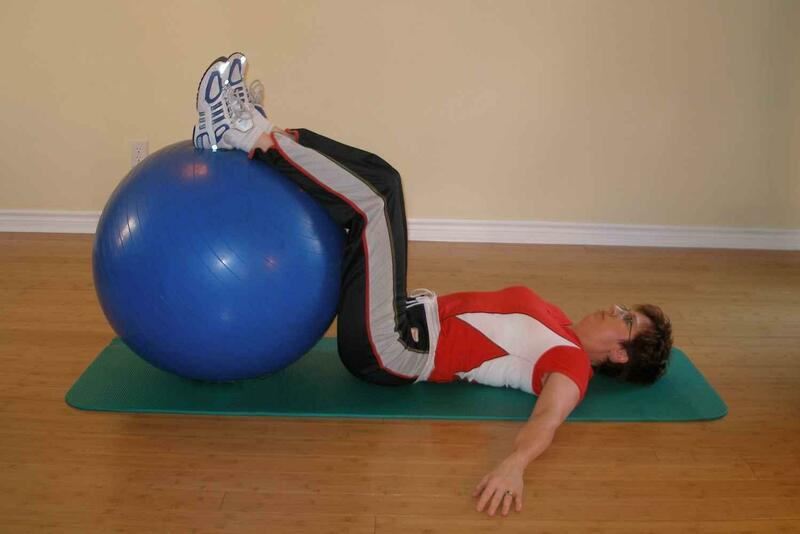 This is a relatively easy ball exercise, one that challenges your back stabilizers gradually. It's just a step up from the floor exercises. Some of the muscles you use to lower your leg to the floor originate on the front of your spine in your lower back. As you lower your leg these muscles will be pulling on your spine trying to force your back to arch off the floor. You need to contract your stabilizing musculature to avoid this movement. You can feel what I'm talking about by putting one hand behind your back as you do the exercise. If you feel your back come away from your hand you need to work harder to hold it stationary. If you cannot manage this, don't continue. Instead, go back and work on the straight leg raise on the floor.